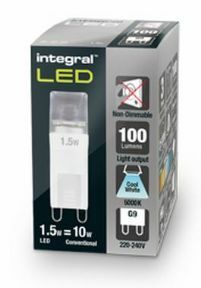 This 1.5W retro-fit Integral LED G9 delivers a cool white light and brightness, similar to a 10W halogen bulb. Ideal for modern living rooms, dining rooms and bedrooms, in classic or modern ceiling lamp fittings. This Integral G9 led bulb operates at 1.5 Watt and produces a bright 100 lumens of cool white light with a wide beam angle of 145 degrees which is protected by the frosted glass cover.